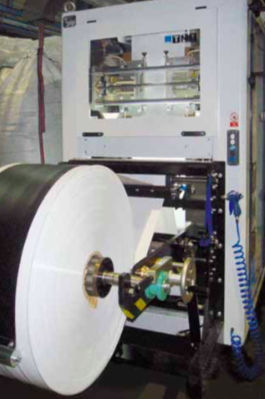 The Ilerbag H is an automatic bagging machine using tubular P.E. rolls. The ILERBAG H is the latest technology in automation processes. Its design ensures maximum reliability having the continuous control throughout packaging process of forming, filling and sealing. During these cycles the bag is constantly manipulated by clamps that prevent deformation of side gussets. It is the ideal solution for those industries seeking the greatest possible reliability, versatility, automation and autonomy in their packaging processes, as well as significant savings in packaging costs. Maximum automation level and reliability. 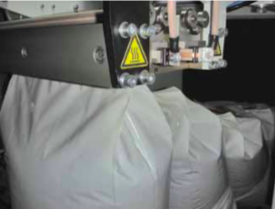 ILERBAG HNT design assures maximum reliability on the bagging process. High bagging autonomy of approx. 1.950 bags per roll. Optimum final look for filled bag. Pre-formed side gusset in combination with corner seals result in a perfect filled bag. The squared shaped bag translates into a pallet with perfect conditions for stability, final look and logistics handling. Two seals per bag minimizes the risk of seals opening. Bags from a standard flat film – vertical FFS – have 3 seals per bag. The most common problem with traditional FFS bags is the back seam splitting open. The problem is eliminated by this machine. Compact bagging line, minimum space occupied at the bagging area.